Lawrence of Berkley and I hit the road again this morning to see if we couldn't catch any of the icr breaker action wrapping up in the St. Claire River. As expected, the had wrapped up earlier in the week and the river was flowing well and mostly free from ice. 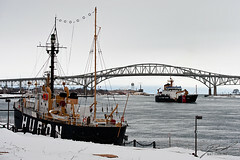 We managed to catch the USCGC Hollyhock downbound under the Bluewater Bridge in Port Huron, then followed her down through St. Claire. The only shot I liked was this one with the Lightship Huron in the foreground.